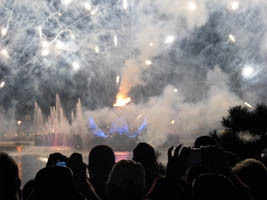 Once again, site partner MouseSteps presents some great photos for my readers to enjoy this time from New Years Eve at Epcot! 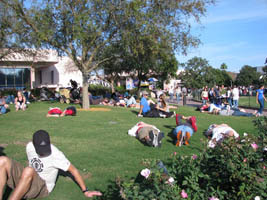 Below left, guests laying in the grass while waiting for the New Years Eve celebration. 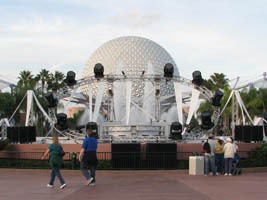 Below right, the main stage at the fountain. 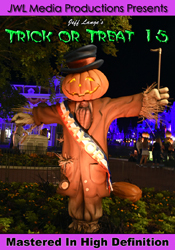 Below right, a cast member hands out horns (free hats and horns were available to all guests). 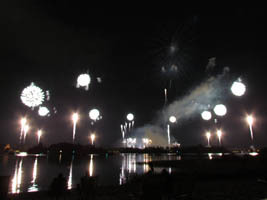 Below right, The special New Years Eve edition of “Illuminations: Reflections of Earth“. 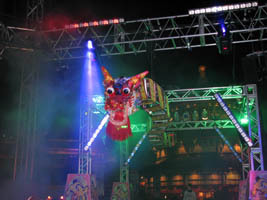 Below left, flames shoot out of the riser at the China stage. Below right, the Chinese dragon is better seen here. 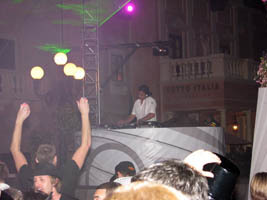 Bottom left, a DJ plays techno music in Italy. 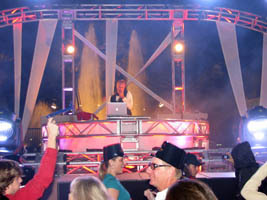 Bottom right, a DJ playing songs at the main fountain stage. 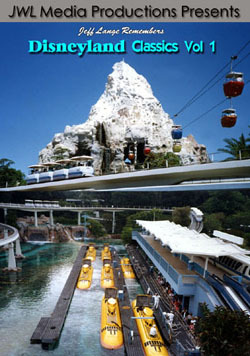 Bonus: Nova Era performing New Years Eve at Downtown Disney! Nova Era was a fixture at the Epcot Italy Pavilion at one time, and were back for New Years Eve this year (playing in front of Fultons at Downtown Disney). 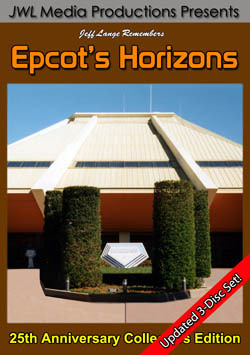 I also have available a full line of Epcot DVDs including my Epcot’s 25th Anniversary series! 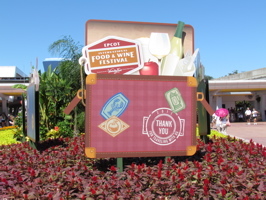 Start your unforgettable day at Epcot by viewing the special 25th Anniversary decor. 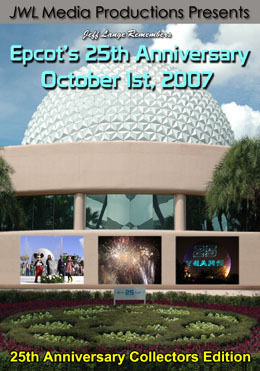 Experience the countdown to the rope drop and join the crowd in wishing Epcot Center, ‘Happy Birthday’! Enjoy front row viewing of this historic Silver Anniversary Ceremony. 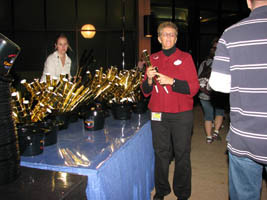 Presenters were Walt Disney World 2007 Ambassador Michael Kelley, cast member and host Tracy Wiu, Walt Disney World Senior VP Erin Wallace, Epcot VP Jim MacPhee and featured speaker Disney legend Marty Sklar. The ceremony payed tribute to Epcot’s original dedication including: Future World cast members marching on stage carrying signs representing the pavilions. The pouring of waters from the 11 countries represented at World Showcase into the Epcot fountain. 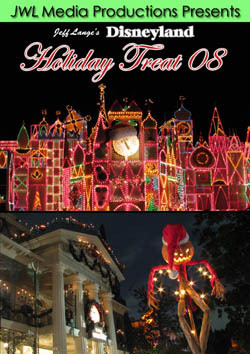 A surprise appearance from Mickey and Minnie plus a special fountain display and daytime fireworks! Experience this unique exhibit showcasing concept art, models and memorabilia from the early days of Epcot Center. 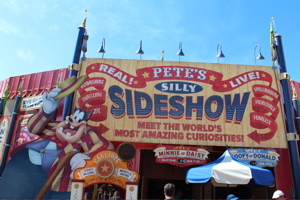 This footage was recorded over several days and features the entire exhibit including planning, construction, opening day, Future World, World Showcase, cast member costumes and Epcot Center collectibles. 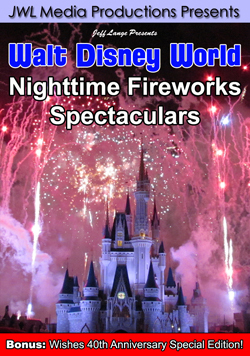 Enjoy the entire multi-media fireworks spectacular recorded live October 1st, 2007. 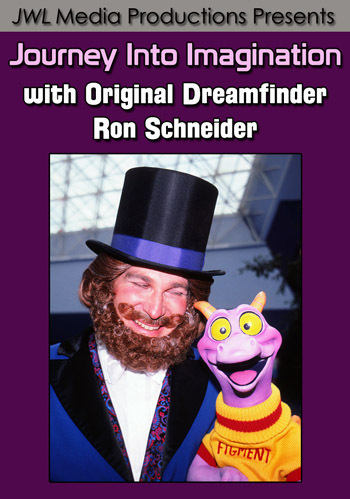 This was a flawless performance of the Epcot classic and really got the crowd excited for the special 25th Anniversary Finale to follow! 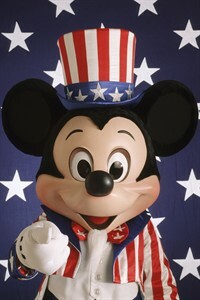 Witness this once in a lifetime finale celebrating 25 years of Epcot with dazzling fireworks and vintage music. 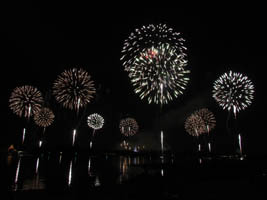 This amazing extravaganza featured more simultaneously exploding shells than I have ever seen! Also featured is a 25th Anniversary laser display projected on Spaceship Earth following the finale. 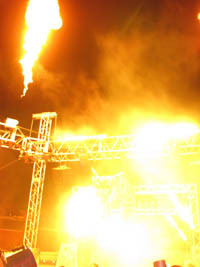 Experience the rarely seen Fire Barge ‘burn off’ where any extra propane is blown out and burned in a gigantic fireball. 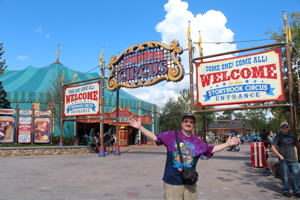 An announcement is made that the following is a ‘final salute to signal the end of another spectacular day at Epcot’ followed by a countdown and the ‘burn off’ itself! 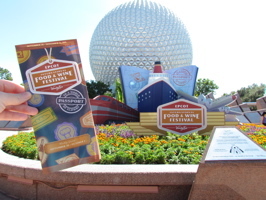 Celebrate Epcot’s 25th Anniversary year after year or experience the magic for the first time by purchasing “Jeff Lange Remembers Epcot’s 25th Anniversary October 1st, 2007“.